Masaru Emoto, born 1943 in Yokohama, Japan, is the Head of the I.H.M. 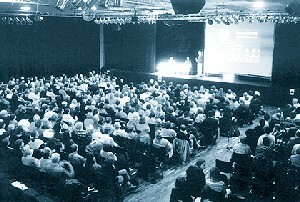 General Research Institute. He has undertaken an extensive research into the nature of water over the last few years. His research has been undertaken from "an original perspective as a human being, rather than solely with a scientific eye", as it says in his second book, "The Message of Water". Topaz has received the author's permission to introduce his extraordinary and profound research. The Danish Nobel prize winner, Niels Bohr, was once seen hanging a horseshoe above a door in his house. Asked by a friend whether he believed in such things, his answer was: "No, but I have been told that it works nevertheless." We all know that there are no two water crystals that are identical. Each has a hexagonal formation, yet each is as unique and individual as the human finger print. 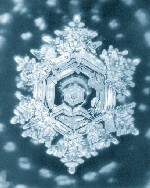 "Beautiful words create beautiful crystals"
During a lecture in March 2002 in Bonn, Germany, Mr. Emoto told the audience that many years ago he began to question why each snow crystal is unique and whether the crystallisation process could be influenced. He later developed a technique to photograph water crystals during the process of crystallisation, and as he studied this he was stunned by what he discovered. He began to recognise that the crystallising process was directly influenced by projecting different words or impressions at the water. He saw that words associated with beauty and fine qualities created beautiful crystals, and words associated with ugliness warped the normal hexagonal crystallisation process! He and his team then played music of various kinds to the water, and the pictures again showed very interesting variations of formations. "You become what you think about"
Throughout the centuries, philosophers have disagreed upon many diverse matters, but most have tended to agree on one idea, which is that "you become what you think about". If water can be influenced by its environment, then it is able to record its experience, and it is interesting to consider this in the light of the fact that more than two thirds of our human body consists of water. It is therefore logical that the water in our body, within the cells, the blood or the brain, stores and records the processes and experiences we have, how we think and feel, almost like a tape-recorder. If this is so, then we must directly determine our state of health and our body's capability by what we think about and how we think about it. As we think, so the brain and other parts radiate fine electromagnetic signals on a constant basis, and the this may in turn print and influence the blood that runs through the cells of our brain in every moment of every day. Mr Emoto's research clearly demonstrates how the power within thought, language and sound can even clean and purify water! Perhaps this is one of the original ideas behind certain religious practices, such as that of using 'holy water' and the ceremony of baptism? As various scientific researches performed in the 1970s have shown, it is now widely recognised that music can influence the growth of plants, either in a positive or detrimental way and that in the same way, music can influence our own wellbeing and brain states. Whilst many people will remain sceptical about Mr Emoto's research, nevertheless the pictures may cause us to question the influence that our internal and external environment may have upon us and may open doors to other associated researches in this area. We include here a selection of photos from Mr Emoto's fascinating and thought-provoking book. Copyright © 2001-2019 The Template Foundation, all rights reserved.